When Erin Brockovich went after PG&E for poisoning groundwater in the desert town of Hinkley, California -- a campaign that later became a film starring Julia Roberts -- the toxic chemical was a heavy metal called hexavalent chromium. Also known as chromium 6, the chemical is listed under California's Prop 65 as causing cancer, developmental harm and reproductive harm in both men and women. A new report out today finds Hinkley isn't the only California city with chromium 6 contamination. The report found 11 water districts serving some 400,000 Californians had hexavalent chromium in their tap water at levels above the state's legal limit. The state’s limit for chromium 6 in drinking water is 10 parts per billion. A part per billion is about a drop of water in an Olympic-sized swimming pool. The report also found the vast majority of samples from water districts serving roughly 8.5 million Californians across the state had hexavalent chromium at levels below the legal limit, but above the public health goal set by state scientists. The report is from the Environmental Working Group, a watchdog agency based in Washington, D.C. The non-profit analyzed data the U.S. Environmental Protection Agency collected from water utilities across the country between 2013 and 2015. An interactive map developed from the data shows chromium 6 levels in California and throughout the U.S.
"It was eye opening," says Bill Walker, co-author of the Environmental Working Group report. "We’re not trying to say the chromium 6 situation is as bad as the Flint situation but we’re saying if you start to look at it more closely you can find some really disturbing things." The chemical occurs naturally in the environment from the erosion of natural chromium deposits but it's also manufactured and used in stainless steel production, metal finishing, chrome plating, leather tanning, and to prevent corrosion in electrical plant cooling towers, as was the case in Hinkley. Outside of the workplace, the main way people might be exposed to chromium 6 is through drinking water. And although the U.S. Occupational Safety and Health Administration regulates chromium 6 in work environments, the EPA doesn't regulate chromium 6 in drinking water. In fact, California is the only state that does. And California has two standards: a legally enforceable limit on chromium 6 in drinking water, and a much lower public health goal. Toxicologists at the state Office of Environmental Health Hazard Assessment set the public health goal for chromium intake at .02 parts per billion. A part per billion is about a drop of water in an Olympic-sized swimming pool. A public health goal must represent a negligible health risk. State scientists said at .02 ppb, the risk of developing cancer for people who drink the water daily for 70 years is no more than a one-in-a-million. State law requires the legal limit be set "as close as is technically and economically feasible" to the public health goal. When the California Department of Public Health set a legally enforceable level in 2014, it took into account factors such as how costly it would be for water districts to monitor and clean up the chemical. Public health officials set the legally enforceable level 500 times higher than the public health goal, at 10 parts per billion. It was the first drinking water standard for chromium 6 in the nation. The state's legal limit represents a cancer risk of 500 people per-one-million, for people who drink the water daily for 70 years. State officials found that getting chromium 6 levels below 10 ppb added significantly to the cost of compliance. To set the legal limit only half as high, at 5 ppb, would have tripled the cost. To reach 1 ppb, the cost would have been 11 times higher. In the EWG report, Los Banos water samples registered the highest level of chromium 6, at 31.5 ppb, followed by Kerman City at 19.2 ppb and Patterson City at 18 ppb. The cities that tested above the state's legal limit run from Sacramento to Los Angeles through California's Central Valley. 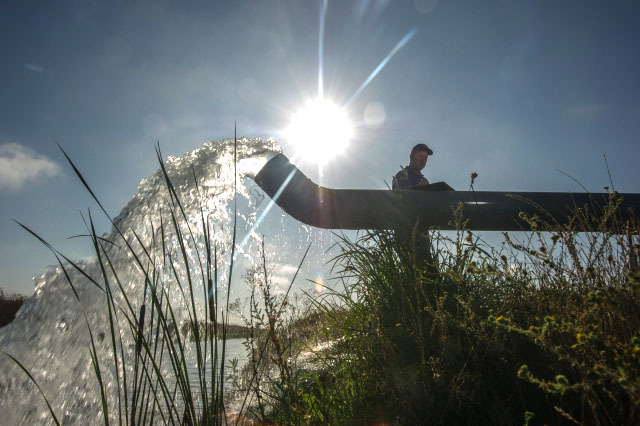 Among the water districts that tested below the legal limit, but above the public health goal are Hollister, L.A. County Waterworks Districts and Vacaville. Residents concerned about elevated levels should "contact their water system to see exactly what is going on and what the treatment is," says state water board public information officer Andrew DiLuccia. Since January 2015, public water systems in California have been required to test for chromium 6 in drinking water. If the contamination is above the legal limit, the district must test its water supplies four times a year. If the average of four consecutive tests exceeds the legal limit, the supplier is in violation. However, since water filtration and well construction is expensive and time-consuming, Senate Bill 385 gives water districts until 2020 to get their chromium 6 levels below the legal limit. But one city manager says California's relatively new 10 ppb rule is too stringent. "Does the state want us to drink distilled water?" asks Ken Moore, Kerman City's Public Works Director. "Cause that’s basically what they’re trying to get us to do, it’s absurd." Results from the EWG report show Kerman's average chromium 6 level at 19.2 ppb, nearly double the legal limit. Moore says the cleaning costs would be millions of dollars and would raise residents' water bills from $35 a month to $150 just to pay for filtering, disposal, and operational overhead associated with removing the chemical. "It’s something we can’t afford," he says. "The people of this community can’t afford to pay for it." Other districts like the Indio Water Authority and Soquel Creek have been able to pay for removal and are now supplying water to their customers that tests below the legal limit for chromium 6. Last Thursday, Willows, a small town between Redding and Sacramento, held a ribbon cutting ceremony to celebrate the successful installation of an ion exchange filtration system. The state-funded water purifier removes chromium 6 from its wells. Kerman has also received state funding under Proposition 1. But Moore says the $3.5 million won't cover all the costs to test, install and maintain six new groundwater wells in the city. For individuals who want to remove chromium 6 from their tap, there are several types of water filters that will do it, including reverse osmosis filters that are available at many hardware stores. The EWG also has an online guide.